Galena High School’s Winter Drumline is pictured above with their second in Circuit plaque. 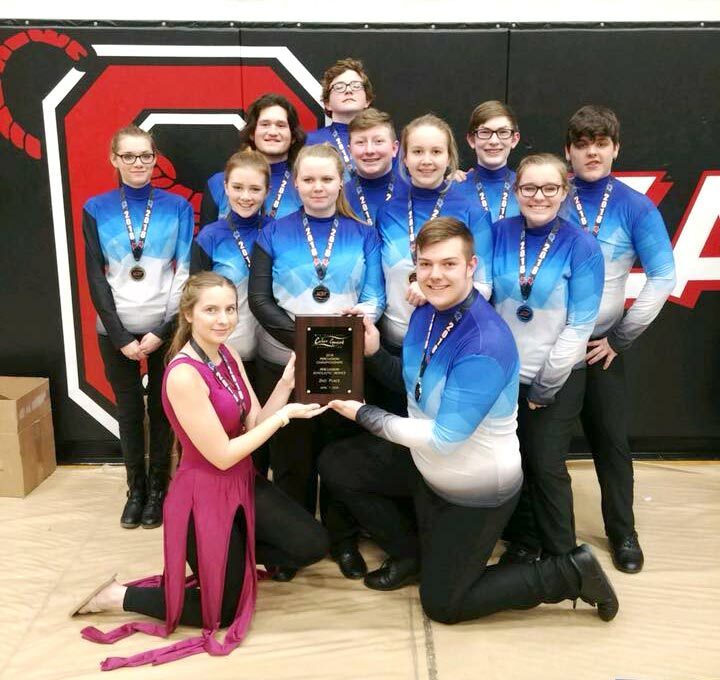 After more than 5 months of preparation and rehearsing, The Pride of Galena High School Winter Drumline took the floor for their last competition of the season on Saturday, April 7 at Ozark High School. They ended their season as second in their division, which is part of a circuit that competes with schools and non-scholastic groups from all over the state of Missouri, as well as Arkansas, Kansas, and Illinois. The music department at Galena has wanted to do a winter Drumline for quite a while, but everything fell into place to do it this year. However, that doesn’t mean this season didn’t come with challenges for the ensemble. Chrissy Lawson, the Faculty Sponsor for the Winter Drumline, says the students put in upwards of 10 hours of group rehearsal per week in the weeks leading up to their championships performance, and about half of the students involved are also a member of at least one other winter sport at Galena. Lawson says the students have been in rehearsals for this show since November. “We could not do what we do without the constant encouragement from other schools’ music directors and staff. Each one of the students have experienced that and it’s really an awesome thing. Even though all these groups are competing against each other, they still want the absolute best for each other, because they all share one common interest: impacting people with music. That’s why we encourage all the other schools and cheer them on before they perform- because they do the same for us. You don’t get to see that very often amongst teenagers, but it’s pretty impressive when you get that ability.” Continued Martin. If you would like to see the Drumline’s 2018 competitive season show, it will be presented one last time at the GHS spring concert on Tuesday, May 8 at 6 p.m. in the Galena High School Gymnasium. The Drumline Staff and Students would like to extend a heartfelt thank you to the following individuals in our community; for without them, this competition season would not have been possible. We hope you will join us also in thanking the following individuals for their financial contribution to the GHS Winter Drumline: Rodney Bennett, Katie Asher, Tonja Martin, Tami Ford, Emily Martin, Julie Martin, Sarah Jo Maples, and Kari Stanton. We would also like to say a very special thank you to the Hancock Family for their contribution which allowed the Drumline to purchase a custom performance floor and uniforms. Special thank you to Mr. Nathan Spurling at Hollister High School, for without his guidance and equipment generosity, the vision for this program would not exist.